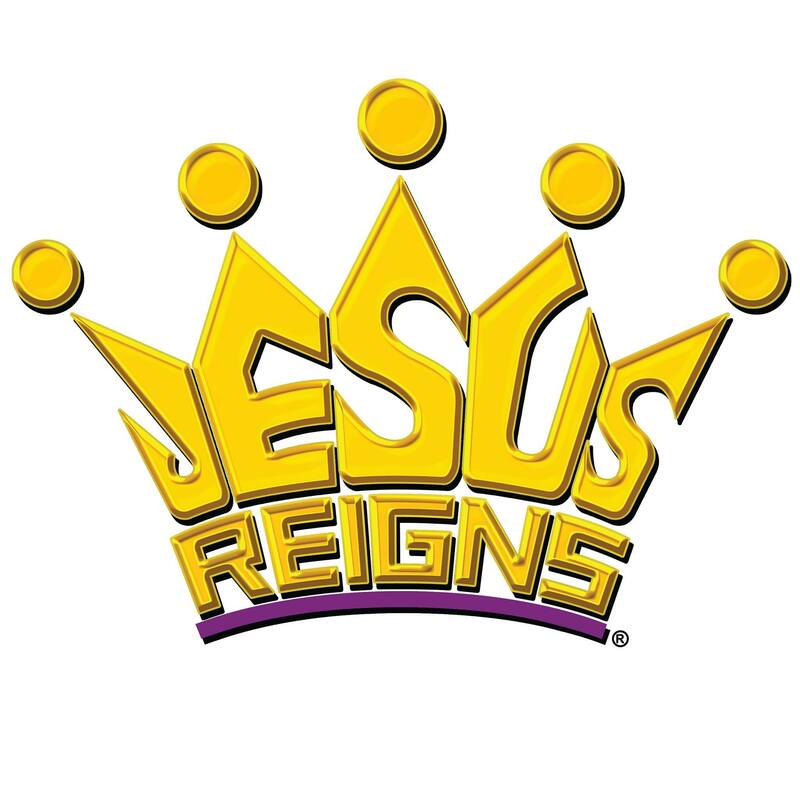 What is Jesus Reigns Celebration? Jesus Reigns Philippines Celebration is an annual gathering of the Body of Christ, nationwide, to celebrate the Lord of Lords and King of Kings, Jesus Christ. JRPC is conducted simultaneously in all 82 provinces of our nation Philippines. We come together in unity and extravagant worship to give our highest praise and honor to Him and Him alone. On this day, nobody shares the limelight with Him. The highlight of the celebration is the enthronement of Jesus as the reigning King over our nation, provinces, cities, municipalities, families and our individual lives. To see every nation consumed by the love of the heavenly Father, empowered by the Holy Spirit, seeking to honor God and worship Jesus Christ alone and exalt the name of Jesus in righteous living as one body for individual restoration and national transformation. To promote unity in the body of Christ, and the Core Values of PAUSE. To reach out to unbelievers and declare that there is hope only in Jesus. Through consistent and purposeful prayer and fasting, we affirm that our strength and dependence to tackle the work set for us will rest upon the Lord and not on our human might. How do we see this activated? All local churches, denominations, pastors, church leaders and members in different pillars of society are encouraged to pray and fast for the Jesus Reigns ministry before and during the celebration. Our significance and identity rest secure in Christ. We acknowledge that the Church, our ministry, belongs to Christ, as the Bride belongs to the bridegroom. Our joy is to see Christ acknowledged, exalted, and honored as He should be. No other name will be magnified or exalted except the name of Jesus. Names of individual or corporate donors will remain anonymous. Jesus should be the only star of that day. Let this culture go beyond the celebration into all our ministries. Everything should be for the glory of God alone. Printed or digital promotional/advertising materials, are not allowed at and in the event vicinity. – No introductions/acknowledgements to all participants on platform. No special acknowledgement to any person in the government. The very heart desire of God is His Family, His End Time Army. We can honor God best when we are united as One Body, One City, One Province, One Nation. The Prerequisite for the full release of God’s authority is when we are united as one Body. Only then can we truly host the presence of God. True Unity is based in Christ, in humility and loving one another. No denomination or church should dominate in running the program/activity. it must allow a greater involvement or participation of all participating churches and denomination. We want to honor God with all that we have. We will not limit our celebration based on our lack but in the abundance and faith in God. Just like David in 1 Chronicles 21:24, who said, “I will not take for the Lord what is yours, or sacrifice a burnt offering that cost me nothing,” the men, women, churches and establishments behind Jesus Reigns: A Day of Celebration have also committed their time, talent and resources sacrificially unto the Lord. No solicitation letter will be given out. We are not begging for money. Only those who catch the vision will give of themselves and their resources freely. No collection of offering during the event day – No giving out of solicitation letters. Our Lord deserves nothing but the BEST from us. Excellence also means excellence in our daily lives. We want to exalt God with righteous living. In anything and everything that we do, we will strive to achieve excellence because the Lord deserves nothing less. Outstanding – beyond the norm. Something that Christians would be proud of. A vision of people marching, bringing banners of the name of the town they represent, streamers that has the attributes of God with no emphasis of any church, denomination and establishment, and a helicopter hovering around the sky bannering the name of Jesus, were revealed by God to a lady in the Lord (whose name she wants to keep anonymous), while she was pondering on the Lord. The vision revealed a grand worship concert and a fireworks display showing the names of God capping the event, and also November 30, 2012 as the date of when the vision should take place. God proved it was His event as He also provided for the title. Initially, different titles popped out to name the event when suddenly the name “JESUS REIGNS” came through. The lady asked for a verse from the Lord to confirm if the said title comes from Him. She was able to read the verses in Psalm 47: 8-9 which says, “God reigns over the nations; God sits upon His holy throne. The princes and nobles of the peoples are gathered together, a [united] people for the God of Abraham, for the shields of the earth belong to God; He is highly exalted.”(AMP) Indeed, the title is a declaration that Jesus reigns in Cebu and in the Philippines! God impressed to our vision keeper to pour oil around Cebu province for 7 days up in the sky, in cooperation of all the pastors/town coordinators in every town representing the 47 municipalities and cities in the province to pray and fast simultaneously, starting at 7 a.m. to 10 a.m., for Cebu. Not only that, intercessors and prayer warriors also adjoined in the airport and seaport areas. November 30, 2012 – First Jesus Reigns celebration! The day has finally come: November 30, 2012. A historic event for Biblical Christianity in Cebu, a gathering of an estimated crowd of twenty thousand evangelical Christians for a day of worship and intercession. What was unique about the celebration was the fact that believers in Christ came without their denominational or local church identities. People were showing their devotion to Christ by wearing the T-shirt and cap of Jesus Reigns. People were organized according to their geographic location, and for the first time in history, every single municipality and city of the province of Cebu – was represented by a group of born again Christians who were willing to stand in the gap as we declared the Lordship of Jesus over the entire province. There were floats of the names of God on a Jesus March in different parts of Cebu. Pastors commanded the crowd to bend their knees and intercede in prayer. The crowd worshipped through singing and dancing, every heart raised to praise Jesus. It ended with fireworks that displayed the name of Jesus: Redeemer. Protector, Savior, Love, Miraculous, Lord of Lords. After the celebration, the forecasted typhoon Pablo entering Cebu province made a change of course. Thus, there is the burden for the body of Christ to unify exalting the name of Jesus alone. She took the step of faith to declare to a crowd of around 400 people and announced that we will have a simultaneous JESUS REIGNS celebration in Luzon, Visayas and Mindanao on November 30, 2013, as a step of obedience to the prompting of the Holy Spirit. God opened doors for the bishops to hear about the vision, and they affirmed the call of God to celebrate simultaneously in all three major regions in our nation. And this time, God’s direction for the pouring of oil and prayer was from Luzon to Cebu to Mindanao. Supernatural manifestations based on the testimony of the servant confirmed more that God was in the movement. She then, together with the pastors who were to pour oil in all over the country, rented an aircraft because that was God’s mandate to do so. They rented a 6-seater aircraft and the vision keeper coordinated everything and when she arrived at the place where the aircraft was, the two representatives from Luzon, two representatives from Cebu, and one from Mindanao were there. The pilot told them that they couldn’t pour oil up in the sky and they can only pour oil on the ground before take-off and after landing. Determined to do God’s will, the vision keeper talked to the captain and reprimanded him knowing that they have agreed of what’s going to be the set-up and the arrangement of the task that they were to do beforehand already. She reasoned out, “You better find a way because we’re doing this for our nation.” The aircraft crew tried to scare them that pouring oil up in the sky would compromise their safety. However, she wanted to do what the Lord was telling them to do. Lo, the crew found a round steel plate under the aircraft and with a funnel and hose, they were able to do it. The vision keeper was up there in the aircraft blowing the shofar with the pastors pouring the oil amidst the turbulence. Before reaching Cebu, they saw three rainbows. When they arrived in Cebu, the lady asked God to show just one more rainbow and she would know that He is doing something in the heavenlies. When they flew to General Santos City, they saw one more rainbow and she said, “Yes! Mission accomplished!” Then, when they were about to go back to Cebu, the aircraft could not start five times and then one of the pastors prayed. The vision keeper said that if they were not to go back to Cebu, it was okay because they were already mission accomplished. The suddenly, the plane started. Then they took off from General Santos and they saw an arc of rainbow; it was very clear; and then another rainbow. The vision keeper said: “Double rainbow, double covenant, double blessing.” When they were about to arrive in Cebu, they saw more rainbows, more or less, they saw at least 10 rainbows during the trip. The pilot told them then that that was unusual. While another pilot said that it might probably be because of their sprinkling of the oil. Lo, the second JESUS REIGNS celebration was held simultaneously in Tondo, Manila in Luzon, Cebu in Visayas and General Santos City in Mindanao in November 30, 2013. 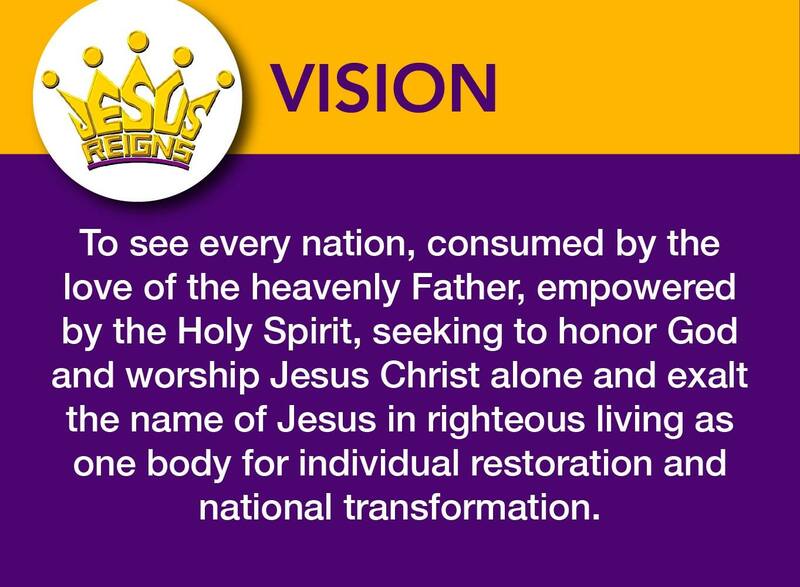 Just as God directed in the past two years to stage JESUS REIGNS for the unification of the body of Christ, our vision keeper received another direction. As she was reading her Bible during one of her devotional times, the Lord brought her to Exodus 5:1 which states, “Afterward Moses and Aaron went to Pharaoh and said, “This is what the Lord, the God of Israel, says: ‘Let my people go, so that they may hold a festival to me in the wilderness.’ And then God asked her: “Do you see a festival in honor of my name (Jesus) in this nation?” Of course the answer is none. And the Lord said: “Challenge the 82 provinces to hold a simultaneous JESUS REIGNS celebration on November 30 this year.” In 2014, 81 provinces responded and celebrated Jesus Reigns!!! God is truly working in our nation. Leviticus 19:23-25 When you enter the land and plant all kinds of trees for food, then you shall count their fruit as forbidden. Three years it shall be forbidden to you; it shall not be eaten. But in the fourth year all its fruit shall be holy, an offering of praise to the Lord. In the fifth year you are to eat of its fruit, that its yield may increase for you; I am the Lord your God. The Lord was making it clear that he wants the Body of Christ to come together to consecrate their hearts back to Him. When we truly return to the heart of worship for King Jesus alone, The Lord himself will break down all idolatry in our country. In 2015, all 82 provinces participated and celebrated Jesus Reigns! In 2016, It was the year of Harvest – and it was also the year that Jesus Reign Japan and Indonesia was born. And Jesus answered them, saying, “The hour has come for the Son of Man to be glorified. Truly, truly, I say to you, unless a grain of wheat falls into the earth and dies, it remains alone; but if it dies, it bears much fruit. As the churches and province came together in total surrender. The Lord faithfully showed His mighty hand as Hawaii celebrated its first Jesus Reigns. For the first time the Emperor of Japan did not do their traditional ancestral worship celebration. In the Philippines exposure of corruption was brought to the light. More drug surrenderees returned to the Lord. More policemen have surrendered their life to Jesus and are empowered. It was also the first year that Jesus Reigns went on a prophetic tour to Israel and blessed the land. 3 Who may ascend the mountain of the Lord? Who may stand in his holy place? 4 The one who has clean hands and a pure heart, who does not trust in an idol or swear by a false god 5 They will receive blessing from the Lord and vindication from God their Savior. 7 Lift up your heads, you gates; be lifted up, you ancient doors, that the King of glory may come in. 8 Who is this King of glory? The Lord strong and mighty, the Lord mighty in battle. 9 Lift up your heads, you gates; lift them up, you ancient doors, that the King of glory may come in. 10 Who is he, this King of glory? The Lord Almighty—he is the King of glory. We all belong to Christ. He calls and beckons us ALL to come before Him, to ascend His holy hill. Every November 30 is a National Day of standing before the Holy Presence of the Lord. One day out of 365 days the Lord requires us to come together as a Nation and come before Him to give our worship and highest praise to JESUS, the King of Kings. We cannot worship or even approach Him with unprepared hearts! Insincere worship is rejected by the Lord! We need to talk about what JESUS Reigns! Really means, how it is to have JESUS reign over our lives, over our family, our church, our workplace, our sphere of influence, city, and our nation. If each one understands, and surrenders fully to the authority of Lord JESUS, then we will be filled to overflow on November 30. The Holy Spirit is taking over! The King of Glory, mighty in battle is ready to totally take over! Are we ready for Him? Have we open up our hearts in surrender to His kingship? Is our city ready to let Him take over? ‘The Battle belongs to Me’ declares the Lord. Revelation 3:20 “Behold, I stand at the door and knock. If anyone hears my voice and opens the door, I will come in to him and eat with him, and he with me.” Are you committed to carry this Vision to your sphere of influence? On November 30, 2018, Jesus Reigns Philippines Celebration will gather the Body of Christ in all 82 provinces to a grand celebration as we worship the Lord of Lords and King of kings, Jesus Christ. In National Capital Region (NCR) the venue will be in QC Memorial Circle, Quezon City. It will be from 2pm to 10pm. This year’s theme is OPEN DOORS. The highlight for this year’s celebration are the floats with the Names of God from every city, dance explosions, extravagant worship and fireworks. Come and experience the Jesus Theme Park with activities such as: Doors to The Youth, Doors to the Nations, Doors to the Pillars of Society and Doors of Breakthrough. Bring families and friends as we exalt and Honor JESUS.